Update 2014-03-18: It appears there's been quite a few more revisions by Wilson, now version 1.6, since I first posted his version 1.0. I've updated the list below to reflect that latest version. 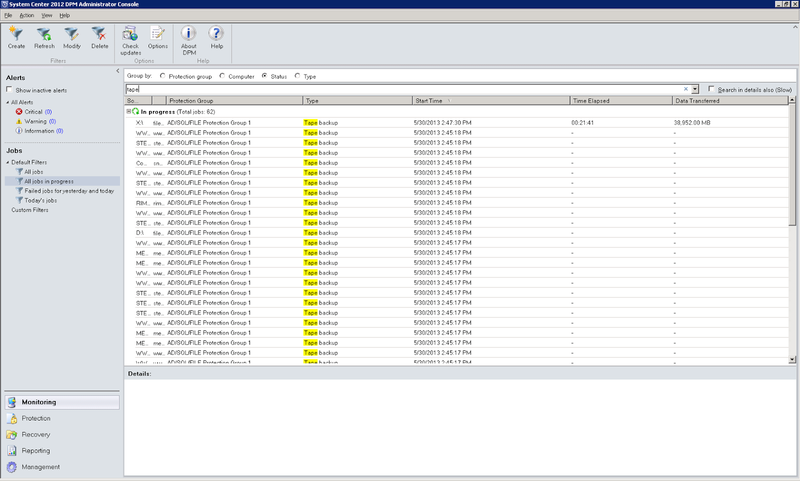 After modifying it to work with DPM 2012 by adjusting line 25 to DPM 2012's SQL instance, $instance = '.\msdpm2012', we were able to run it to re-trigger one of our failed weekly tape backup. Hopefully this post will be a bit easier to find - but credit still goes to Mike and Wilson, I'm only the messenger. We did notice that you need to be sure and inactivate any alerts that are still active and it takes a minute or two to see the jobs kick off. $instance = Get-itemproperty "hklm:\SOFTWARE\Microsoft\Microsoft Data Protection Manager\DB\"
write-host "     Protection Group               SQL Agent Name                       JobDefinitionID                      Creation Date Schedule Creation Date Last Run Date        Next Sched Run Date  Term       Goal            Tape Label"
write-host "     ------------------------------ ------------------------------------ ------------------------------------ ------------- ---------------------- -------------------- -------------------- ---------- --------------- --------------"
write-host "     Protection Group               Term       Goal            Tape Label"
write-host "     ------------------------------ ---------- --------------- --------------"
$runjob = $runjob -split " "
Nice post.There are many thing that i read first time.i found it helpful and informative. it is excellent and very informative..Thank you for sharing. 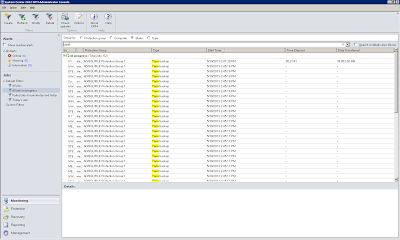 Given the Microsoft uneccesary complexity found in DPM for such a simple task as "Trigger this tape backup Now! ", Justin's script is a Life Saver. Thanks and Congratulations for a Job Well Done! It is really Wilson Souza who deserves the praise. Just had to use his script again yesterday. Great work. Just used the script to trigger yearly backup, because i had problems with scheduled job "not doing anything". backups getting moved out by a month and year respectively." - ??? Whatever... Thank you very much. Thanks! The Access Manager service stopped over the weekend and I had to re-run all the weekly tape jobs. I also found 2 groups that had an extra monthly tape job. Great script and good work!! !